A modern, gabled home in Austin is designed to feel like a "leftover railroad house that had been repurposed." 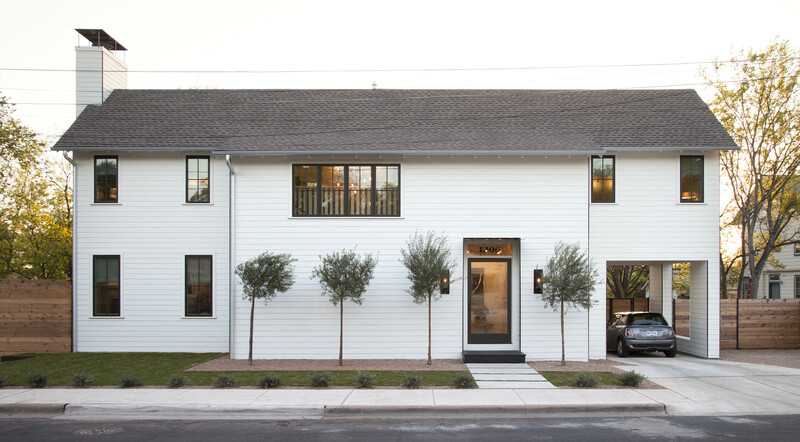 The exterior of the new, two-story home in East Austin, Texas was designed with a minimal palette, bronze windows, and steel details in order to blend into the existing cityscape. Flournoy’s partner is a baker, and was given free reign to develop a kitchen that met his needs. 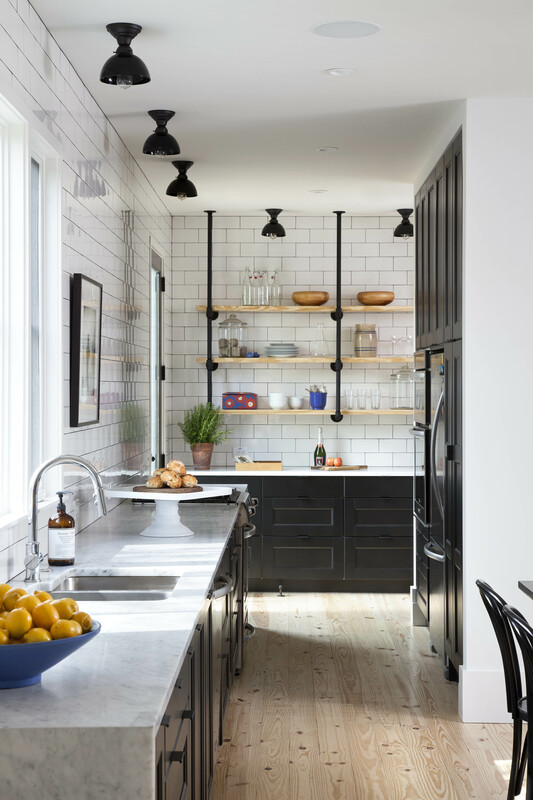 The space combines black, Shaker-style cabinets, white subway tiles, Carrera marble countertops, and wooden floors to create a balance between rustic warmth and industrial simplicity. The kitchen and adjoined dining space have a light, open feel, as does the rest of the home. Complementary design elements, like the low-slung steel bookcase next to the stairs, which Flournoy’s partner organized according to color, reappear throughout the house. Pops of color add an appealing break from the largely monochromatic palette, and reinforce the couple’s design aesthetic. The Bistro chairs are from Crate and Barrel. The juxtaposition of black and white is perhaps the most notable detail of the home’s interiors. In the guest bathroom, black and white tiles provide visual interest. Flournoy’s favorite aspect of the design is that “every space in the house is used and appreciated.” This light-filled hallway overlooking the staircase connects the home’s two bedrooms to an upstairs living space, and provides the ideal spot for another bookcase. Flournoy and his partner found the hall chandelier, along with the salvaged mill table that they repurposed as their kitchen island, on a trip to Chicago. Additions of color in the interior are minimal, but when they are included, they make a lasting impact, such as with this rainbow art piece by local artist Roi James. “Although we had commissioned the piece based on a recent show we went to, I don’t think either of us realized that it would work so well with our [colorful] cookbook display [in the dining area],” Flournoy admitted. The rug and brass side table are from West Elm, the couches from Scott+Cooner. The butterfly chairs were custom made by Robert Smith. White walls, a luxurious marble double-sink, and an area rug give this bathroom an inviting atmosphere. “The natural light, open spaces, and light color palette make it a great place to wake up in the morning,” Flournoy says of his home. The sink is from Restoration Hardware and the rug is from West Elm. The caged staircase was designed by architect Patrick Ousey, with whom Flournoy collaborated in the home’s design. Although initially unconvinced by the staircase detail, “it is a great example of how collaboration brings in different perspectives,” says Flournoy. When beginning construction, Austin-based contractor Royce Flournoy hoped that the simple, gabled structure of the farmhouse-style home he now shares with his partner would blend seamlessly into the urban space around it. Because their home is located near a metro rail stop, Flournoy imagined that the bronze windows, steel details, and simple, gabled structure “would feel like a leftover railroad house that had been repurposed,” rather than a brand new, two-story home. The result was a simple, but unmistakably modern home, whose unembellished white exterior interacts well with the lively context of East Austin architecture. Flournoy collaborated with architect Patrick Ousey to create a timeless appeal for their interior space. The open kitchen and large windows invite plenty of natural light, and clever design details like a screened staircase with vertical steel slats filters light from above, elevating the structure from simple farmhouse to a well-considered, contemporary home.